• SIP buildings use approximately half the energy of conventional buildings. • SIPs can be used for virtually any building design and are particularly useful when open designs with long roof spans are desired. • SIPs can be erected in approximately half the time of a conventional building. • SIPs are an engineered product that can be designed to meet the required loads but are also inherently much stronger that conventional framing. • Owners of SIP buildings report less interior noise, fewer drafts, and more consistent interior temperatures due to the continuous foam core inside every SIP. • Due to their inherent air-tightness, SIPs make control of indoor air quality possible since incoming air can be filtered and stale air can be expelled in a controlled manner. • SIP buildings can be insured less expensively specifically in high wind areas due to their superior strength. • Building with SIPs helps earn many LEED points. PorterSIPs are designed on state-of-the-art 3D CAD software, are CNC cut, and are audited by a full time Quality Assurance staff. Also, SIPs, due to their balanced composition of OSB on the interior and exterior, are much less likely to bend, bow or twist compared to conventional stick framing. The OSB skins of the panel are continuous and are an engineered product, therefore not as susceptible to “settling” that is common with stick framing. Finally, the PorterSIPs production facility and process is audited for quality by a certified third party inspection agency. Factory built building components like SIPs are manufactured in an environmentally controlled facility. Compared to field framing, manufacturing in a factory is much more precise with better tools, tighter tolerances, and full time quality inspectors. All of this leads to easier and faster assembly of these components in the field and a higher quality building with fewer problems over its lifetime. SIP technology transcends the building market. It does not belong exclusively to the big or small builders. It does not belong to any one shape, size or style of building. SIPs are a product that is adaptable to customized mass production. No longer must a mass builder confine construction to their repetitive structures in huge plots. Jumbo SIPs can be cut and shaped to various configurations which conform to plans drawn on a computer. 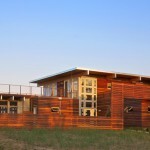 With CNC machine-cut SIPs, architects, builders, and owners can easily create custom buildings. Building with SIPs offers cost advantages to the builder in terms of speed of construction and reduced labor requirements. Panels are pre-manufactured to exact specifications so they arrive ready to install and fasten together quickly. 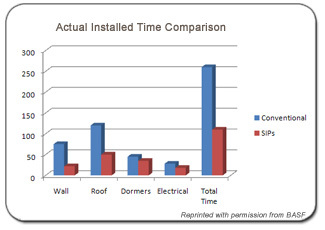 A recent time & motion study conducted by Reed Construction Data RSMeans Business Solutions showed that on one project, utilizing SIPs reduced installation time by 130 labor hours. When compared to RSMeans labor hours for a conventionally framed home, this labor requirement is equivalent to time savings of approximately 55 percent. The house used for the study was a two-story, three-bedroom, 1,176 –square-foot, cape-style home with three dormers on a 12/12 pitch roof. RSMeans cost data was used to benchmark the time and cost for erecting conventionally-framed stud walls, roofs and dormers using exterior sheathing and fiberglass batt insulation. Thanks to this speed of construction, SIP projects are completed sooner. There are fewer hand-offs between trades so crews are more productive – no more waiting for the insulation group to come in after the framers. SIP walls are flat and don’t warp, expand or contract, enabling doors and windows to go in quickly as designed. All wall intersections are true so cabinets install quickly. There is no need to search for a stud when using SIPs because cabinets, drywall, and finish trim can be screwed anywhere on the interior OSB skin. It all adds up to reduced field adjustments which yields time saved. Perhaps most importantly, these technologies can help reduce call-backs, keeping crews moving forward to the next project and improving overall productivity.